By Melissa Lennig on December 14, 2013 98 Comments. This content contains affiliate links. As an Amazon Associate I earn from qualifying purchases. My oldest son received his first pair of sneakers with laces this week! He is incredibly excited to learn how to tie his shoes. 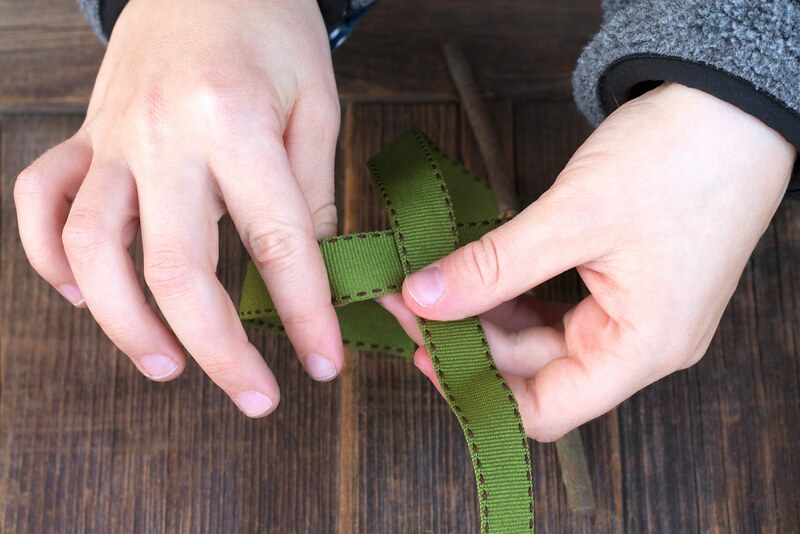 To help him practice, we spent some time creating a ribbon Christmas tree ornament. 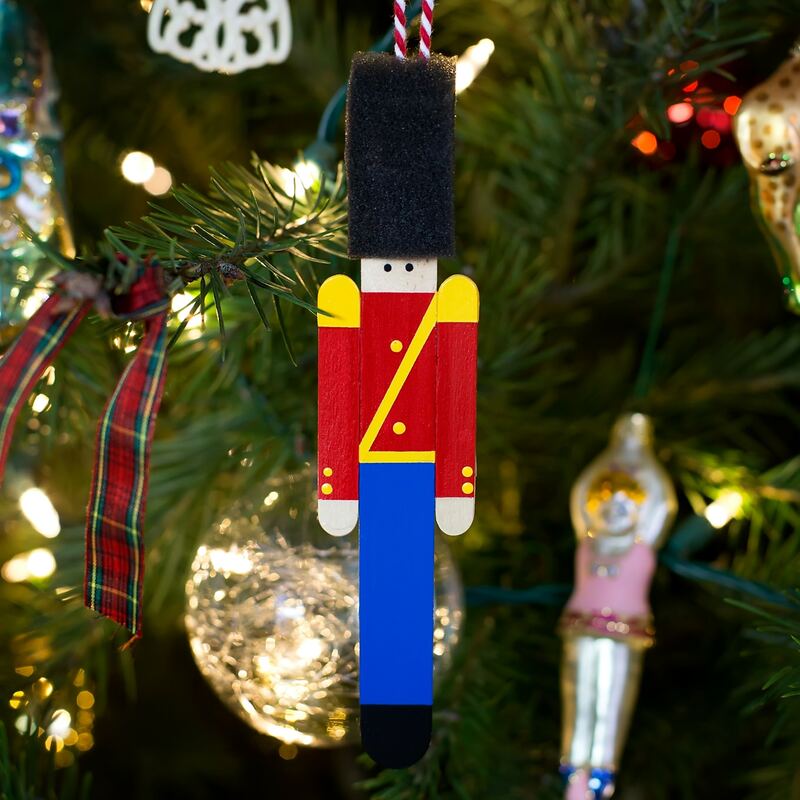 These Christmas ornaments are lovely and we can’t wait to give them away to friends and family. More importantly, they helped my son master the first step in shoe tying. 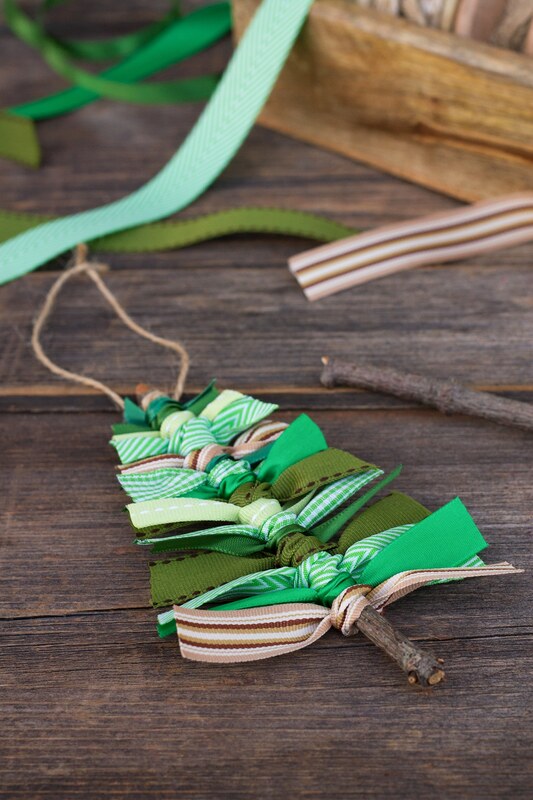 After gathering supplies, invite kids to tie the scraps of ribbon down the twig or cinnamon stick. For best results, bunch the ribbons close together. The ribbons will bend and slightly overlap. Gently tug them into place until you are satisfied with their placement. 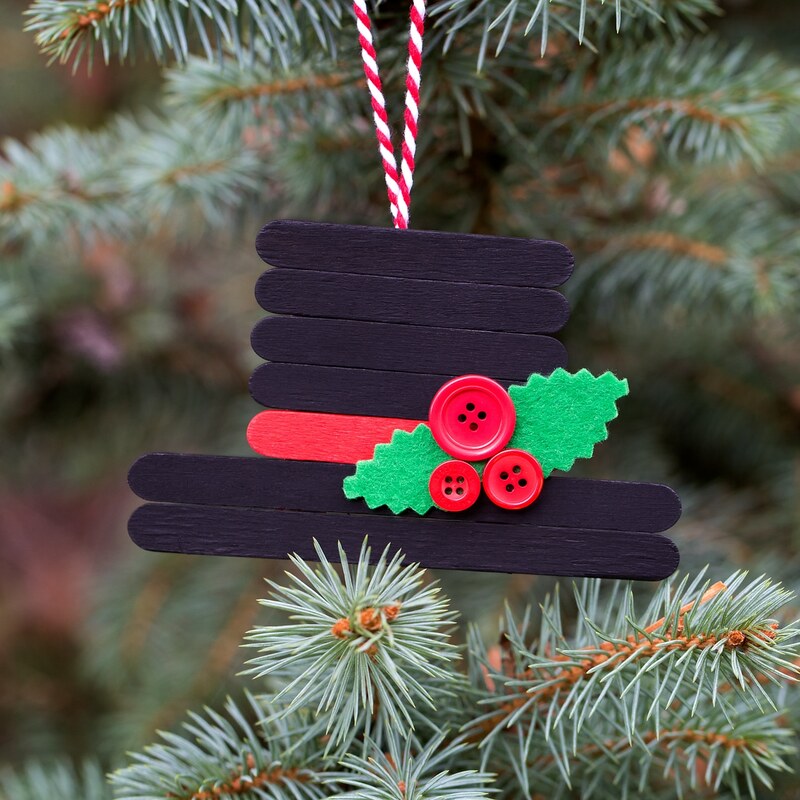 Use sharp scissors to trim the ribbon scraps into the shape of a Christmas tree. If desired, melt the edges of the ribbons with a match so the ribbon doesn’t fray. 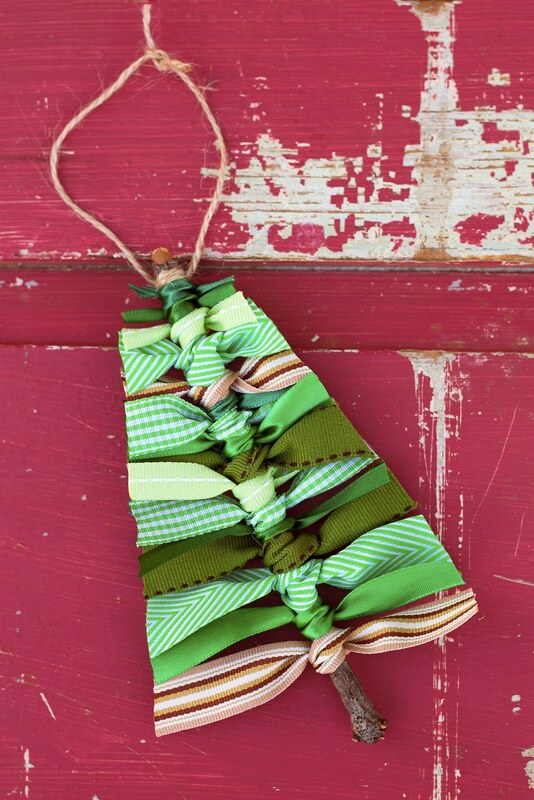 Hot glue or tie a loop of twine to the top of the tree. If desired, top the tree with a wooden star, yellow button, or primitive metal star. 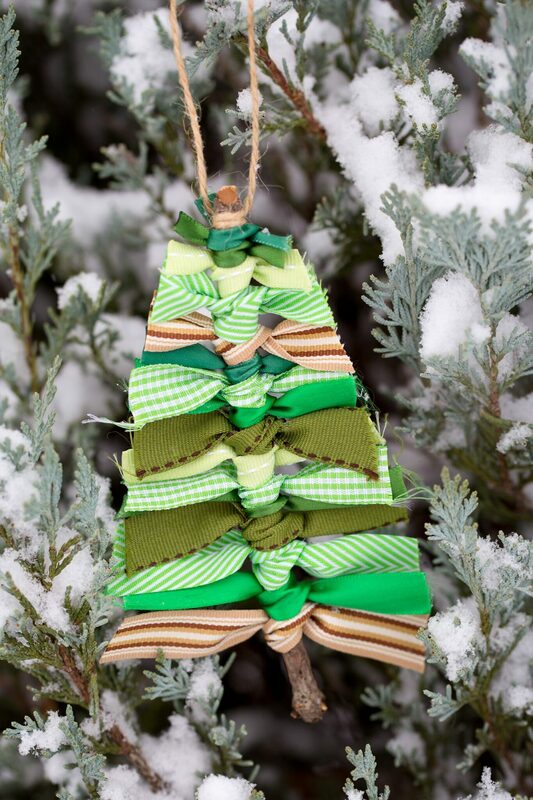 Your Scrap Ribbon Tree Ornament is complete! 1. 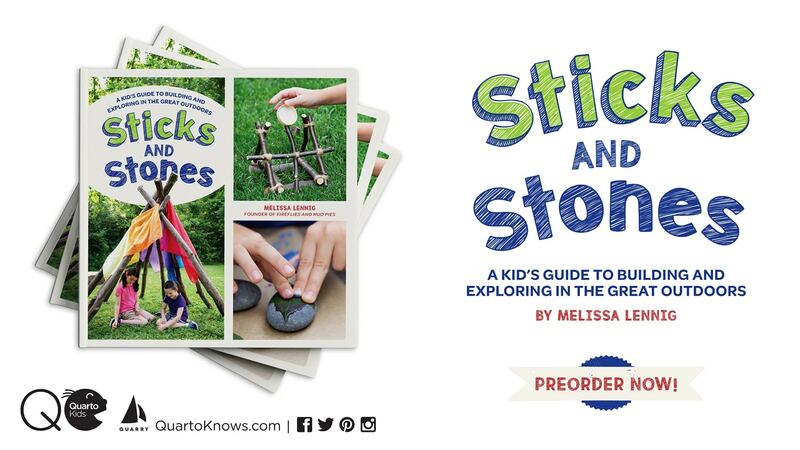 After gathering supplies, show kids how to tie the scraps of ribbon down the twig or cinnamon stick. I’ve found that wide ribbons, tied into single loose knots, give the best coverage. 2. For best results, bunch the ribbons close together. The ribbons will bend and slightly overlap. Gently tug them into place until you are satisfied with their placement. We used between 13-16 strips of ribbon for each ornament. 3. 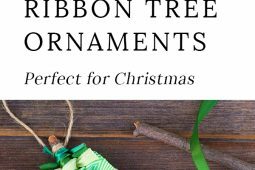 Use sharp scissors to trim the ribbon scraps into the shape of a Christmas tree. If desired, melt the edges of the ribbons with a match so the ribbon doesn’t fray. Tip: Worried about ribbon waste? 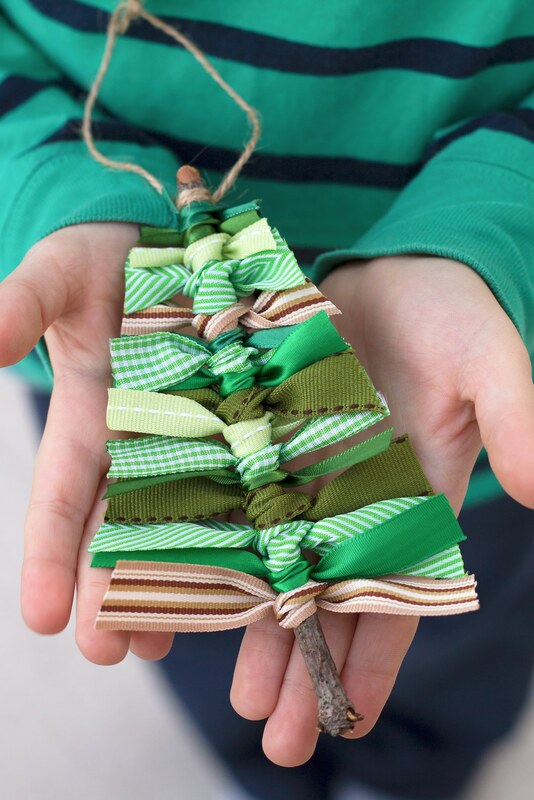 Use your small scraps of leftover ribbon to make an adorable Pine Cone and Ribbon Turkey! I happen to adore how a little fray gives the ornaments a more primitive look. (I even tugged a little more at the edges of the ribbon to make this happen!) 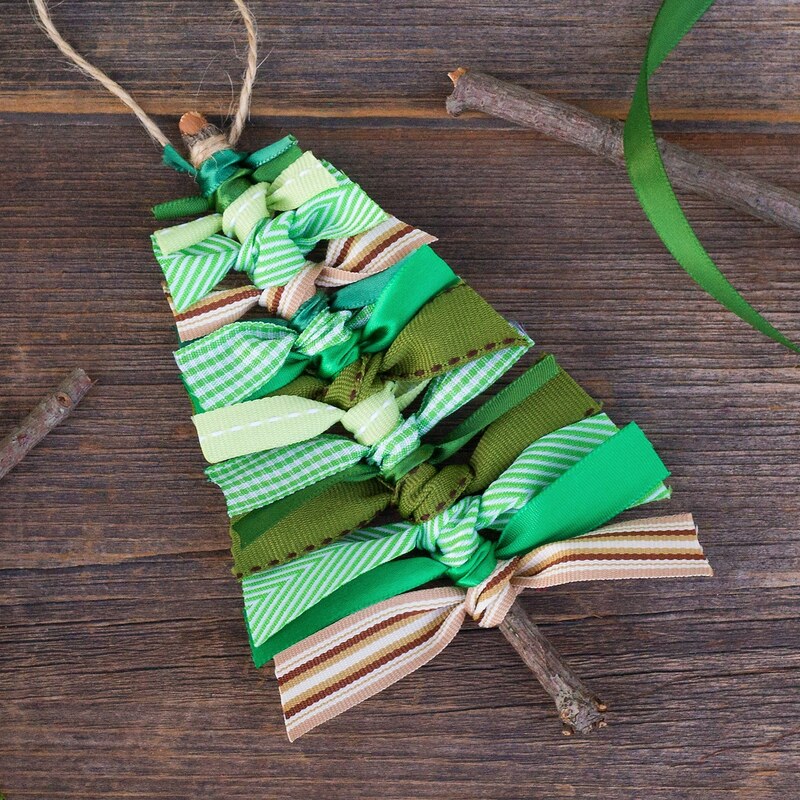 This effect can also be replicated with cotton and wool fabric scraps; I’ve also made this ornament with cinnamon sticks and flannel…it looks just as adorable! 4. 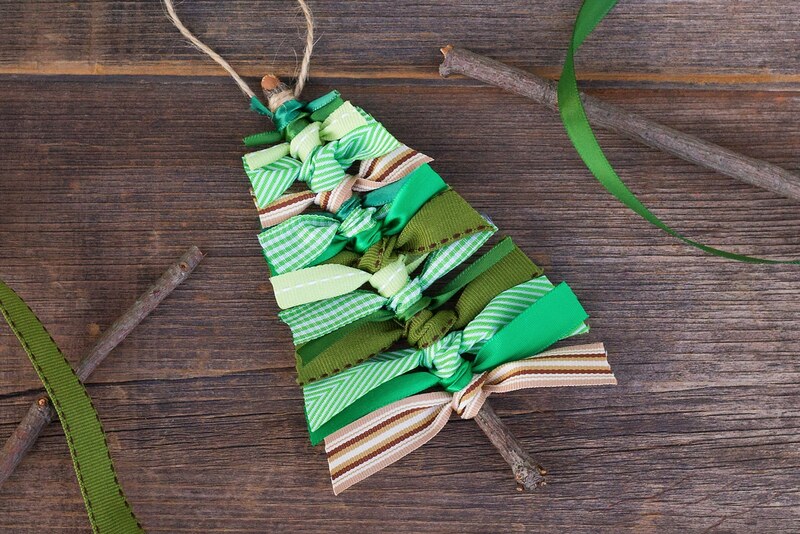 Hot glue or tie a loop of twine to the top of the tree. If desired, top the tree with a wooden star, yellow button, or primitive metal star. 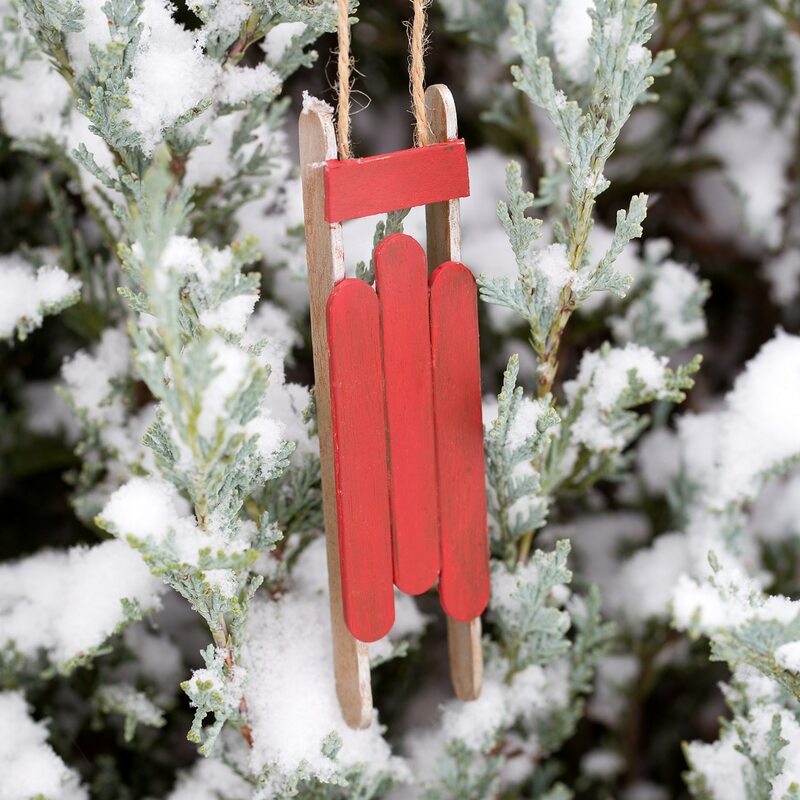 Click the images below to view more creative homemade Christmas ornaments. Some ribbon is soft and I don’t think it would stick out like this. What kind of ribbon did you use! No ribbon tricks! It’s just regular craft ribbon you would buy at the craft store. As you can see from the pictures, there is a variety of textures. What size of ribbon should I get? I’m thinking the 3/8 is too small. What size ribbon was yours? I didn’t measure it, Jessica. Me and my mom are going to do the tree at the top for a Christmas craft fair at my school and we are super exited!!! We made these yesterday and had floppy ribbons till I squished the knots together as tight as possible. This makes most ribbons stick out. We used a variety of widths and they came out great. 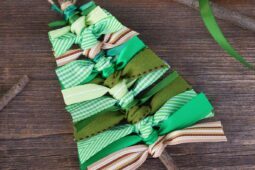 I was wondering what width of ribbon you used for the christmas tree ribbon ornmanets. I tried using 3/8″ and found it was too narrow.